The Iron-home, domain of the Witch-king, is a cold, bleak land roamed by dark-robed Warrior Priests. These sinister wanderers oversee the slaves, soldiery, and Orcish tribes who serve the master of Carn Dûm. Fear is their whip-handle and shadow their wake. The sunshine of Angmar is thin, the bitterness of the climate lodges deep in both the land and its inhabitants. The Iron-home's chill darkness threatens not only neighboring Arthedain, successor kingdom of Arnor, but all the Free Peoples of Middle-earth. 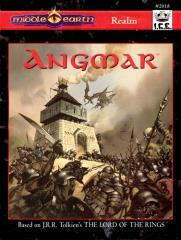 Angmar is a reprint of the 1989 ICE campaign module titled Empire of the Witch-king. This reprint as a realm piece features the excellence of the previous bestseller along with a plethora of exquisite new illustrations. Angmar includes complete stats for MERP, the Lord of the Rings Adventure Game, and Rolemaster.